Get Well Quotes & Wishes For Speedy Recovery | Wishes SMS, Well wishes text messages, etc. Sickness is quite an enemy. What won’t we give to never have it come around us or our loved ones? It gets you down and leaves you unable to do a lot of things you love. It can even prevent you from enjoying food, simply by plaguing you with a loss of appetite. Unless you have a nice insurance policy prior, the cost of medication is not child’s play. A lot of times family might have to stay off work to tend to the sick person’s needs. Or spend a lot of money to hire caregivers. In all of these, sickness is no good. Get well wishes go a long way to make our loved ones feel better and they also even heal faster when there is a lot of love and support around them. #1: You look very terrible. Sickness doesn’t look good on you. Hurry and get back to your radiant self. Speedy recovery, dear. #2: You’ve been on all your medications as the doctor prescribed, I wish you the strength and hope you definitely get well soon. Speedy recovery. 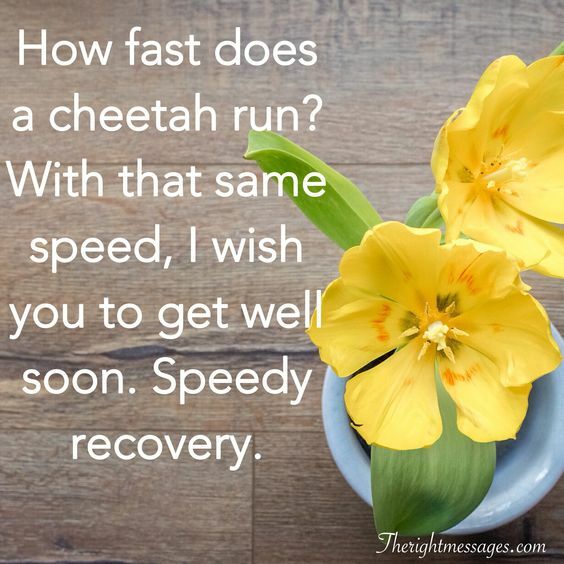 #3: How fast does a cheetah run? With that same speed, I wish you to get well soon. Speedy recovery mate. #4: Life in this neighborhood is boring without you. I can’t even find someone to talk to. Please, get well soon. For me, at least. 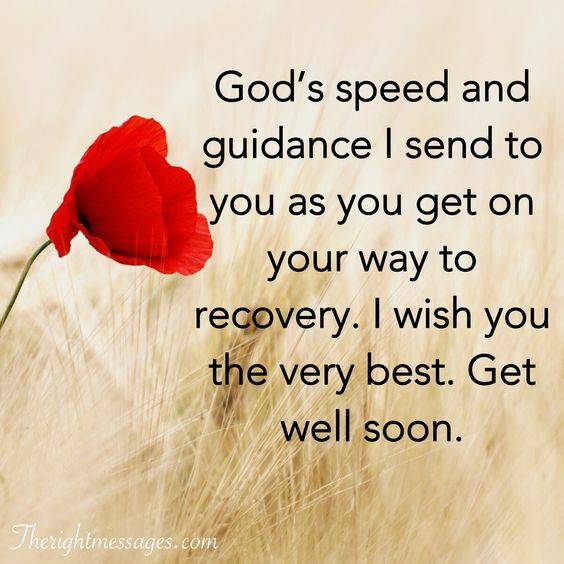 #5: God’s speed and guidance I send to you as you get on your way to recovery. I wish you the very best. Get well soon, dear. #6: I will get a magician with a magic wand to fix you if I could, I can’t bear you staying so long in treatment and recovery. Get well soon, or I get the magician. #7: Please, religiously stick to your drugs. Make sure you don’t joke with them, or joke with the doctor’s general instructions. I wish you a holistic recovery. Get well soon, dear friend. #8: Illnesses help us confirm our humanity. Not that I feel comfortable about yours, I actually want you to be firm and fit as fiddle, but we have to observe nature whenever it comes calling. Nevertheless, please, get well soon. #1: Your sickness made you stay off work, now I have to do all the work alone, it is very tough for me. Look, I need you back on your feet. You need to get well. Speedy recovery, dear. #2: All of us at the office miss you already. The family is now obviously incomplete. Hurry and get well soon, you are needed. Speedy recovery. #3: We need you back, even if all you would do is sit and chat, we want you back. Speedy recovery, dear. #4: They need to kick you out of that hospital and send you straight to the office. Speedy recovery. #5: There is no fun in being in the hospital. We can’t let you continue to stay there. We need you in the office immediately. Get well soon. #6: We are coming with flowers and a shipload of goodies. We are coming to the hospital. I know how much you hate public attention, and that’s why we are bringing those. Better get well soon. Or, we come to the hospital and do exactly what you hate. #7: The hospital is no home for intelligent people like us in an industry like ours. You need to get out of there, everything is moving so fast. Speedy recovery, colleague. #8: Even our cocky boss has admitted to have missed you. What are you still waiting for? Get up and get well. Godspeed, dear. #1: Oh, dear. I am so sorry that you had to eat hospital food. If only you agreed earlier to get well and leave the hospital for good. Anyways, speedy recovery. #2: I got some words off the book “Harry Potter” and got a stick which I used as my magic wand. I cast some spells to have you healthy, I don’t know why it’s taking so long. Just get well soon. #3: Too much beauty attracted this virus to you. If you weren’t so beautiful, you wouldn’t have gotten sick. But just get well soon, anyway. #4: When you were still healthy, we literally begged you to rest. For you, it was one project after another. Now you are under compulsory house arrest and you have to get all the rest and sleep you missed. Speedy recovery, dear. #5: I miss our gossips. You need to leave your sickbed and come complete what we were saying the other day. Get well soon, for the sake of gossips. #6: You are being punished with sickness for eating the pizza you ordered without giving me a bit. This should teach you a lesson. Get well soon, nevertheless. 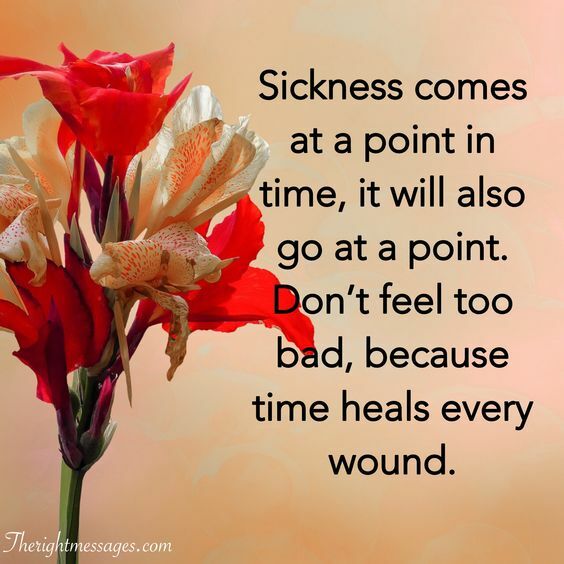 #1: Sickness comes at a point in time, it will also go at a point. Don’t feel too bad, because time heals every wound. #2: A look outside will convince you that the sun is shining very bright. It is telling you, get better and get going. The universe want’s you alive. #3: Everybody eagerly awaits your return. The absence of your laugh makes the environment quite lifeless. Healthy families stick together. #4: You should know sickness steals you away from family so they will always be there to wish your health back and pray that you have a speedy recovery. #5: Sending flowers in place of hugs and kisses to tell you how much they miss you and how much they want you to get well and get back on your feet. That’s what friends are for. #6: Your friend’s thoughts, prayers and good wishes stay with you in times of sickness. 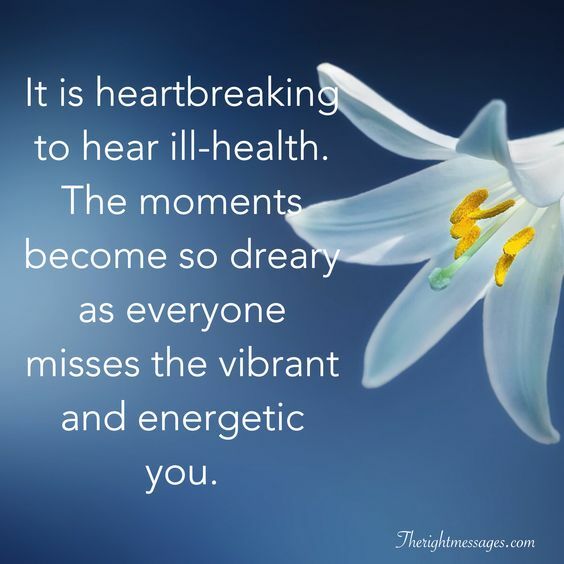 #7: It is heartbreaking to hear ill-health. The moments become so dreary as everyone misses the vibrant and energetic you.